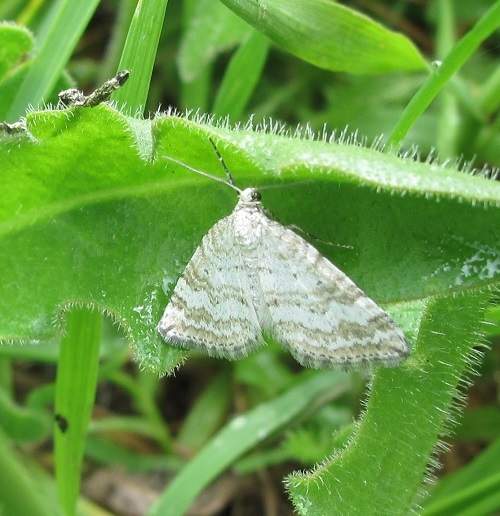 A small pale day-flying moth frequenting areas of dry chalk or limestone grassland where its foodplant, Yellow Rattle, is found. Sometimes it is the most abundant member of the Lepidoptera to be seen on the meadow. The strength of the pale brown bands on the wings varies, so that individuals can be very pale, often looking white in flight. The darker individuals show a pale wavy bar across all the wings, hence the name “rivulet”. The flight period is from May to early July. Ripening seeds of Yellow Rattle. Grasslands, often on chalk or limestone. Resident, fairly well distributed and locally frequent.